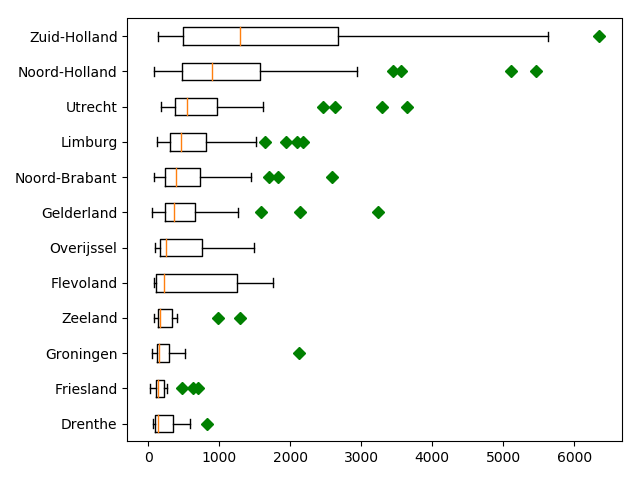 I am currently working on some exercises for which I need data about municipalities in the Netherlands. A good place to look for such data is the CBS (Dutch Central Bureau of Statistics). One data layer is vector layers of the dutch municipalities and neighborhoods, which include demographic data. One of the first things I normally do when exploring new data is to look at the distribution of the data. For example by creating a histogram using the d.vect.colhist addon (see my earlier post). But what if I want to compare the distribution of different groups or samples? In such a case I find boxplots more convenient. 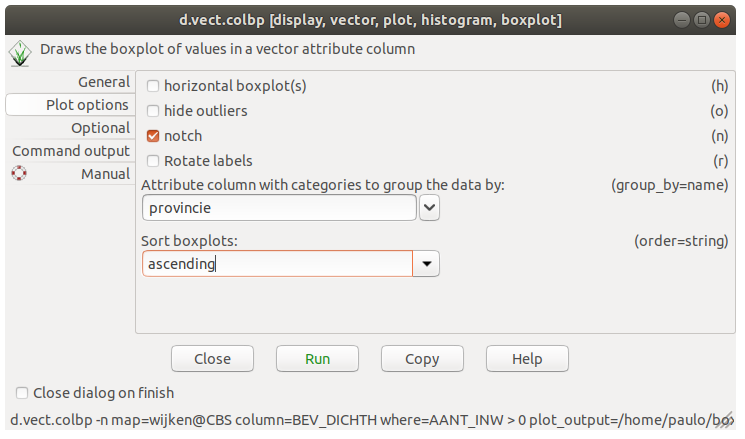 However, there is no tool in GRASS GIS to create boxplots, so I had a look at the d.vect.colhist addon code and adapted the code to create boxplots instead of histograms. Let’s for example look at the average population densities of the municipalities. The average population density (number of inhabitants / km2) per municipality in 2017. Source: CBS. What if I want to compare the distribution of the average population density per provinces Dutch provinces? You can install the addon (see the end of this post) and run d.vect.colbp on the command line or the console. This will open a window with different tabs. The distribution of the average population densities of the Dutch municipalities per province. You can of course also use the command line. 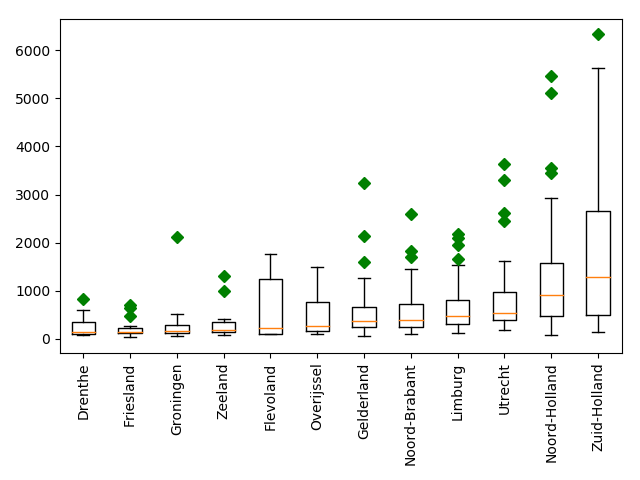 In this case I will plot the boxplots horizontally using the ‘h flag’. With will give you the plot below. The add-on does not provide further options to change the appearance of the plot, as the main idea is to use this for quick exploration of your data, similar to the other plotting tools in GRASS GIS. However, you can save the plot as a svg file, and further edit it in e.g., Inkscape. Any feedback will be most welcome. If you try it out and run into problems, please let me know (suggestions for improvements are of course also welcome). GRASS GIS has convenient tools to draw histograms of raster values. As similar tool to draw a histogram of values in a vector attribute table lacks. 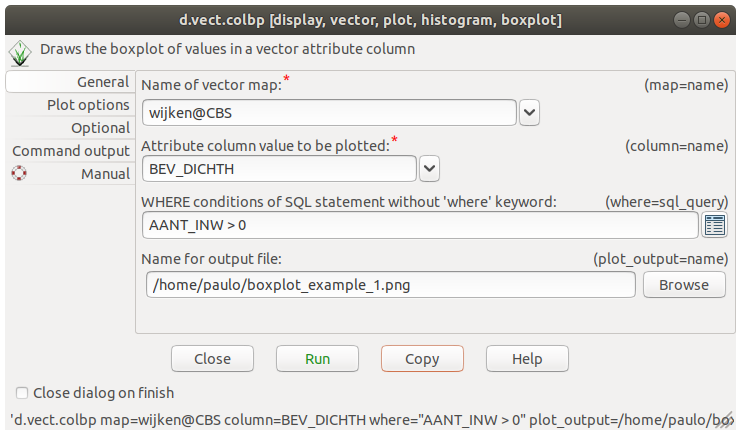 But you can easily add this functionality by installing the d.vect.colhist addon by Moritz Lennert. Read this short post on Ecodiv.earth tutorials.